The Graco Modes’ easy fold and self standing design make it a breeze to store. We found the Graco folded to a reasonably compact size, and the auto-stand and lock feature really help keep it tucked out of the way. In fact the lock and stand feature ended up being the deciding factor for us once we narrowed the field to 2 units. 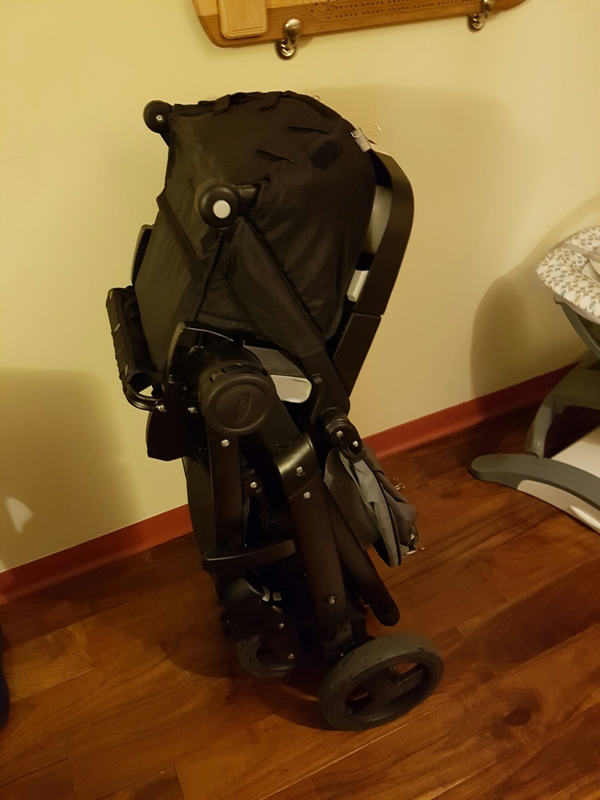 This stroller fits comfortably in our closet, even with the seat still attached. For even more compact storage, the seat can be removed packed flat, but the extra step doesn’t save you enough space to make it worth-while each time you put the stroller away. Most strollers fit width wise in our local transit, although I did get some sideways glances when I pulled out the tape-measure on my morning commute. Handicap regulations are typically very stringent, and strollers usually fall within those guidelines. Still, never hurts to check. This is where a survey/database tool would REALLY come in handy. What sort of person are you? What kind of activities do you enjoy? Where do you live in the world? We have only been using this stroller for 4 weeks now, but in that time we have gone for a walk every day, it’s nice to get out of the house and get some fresh air while the weather allows! 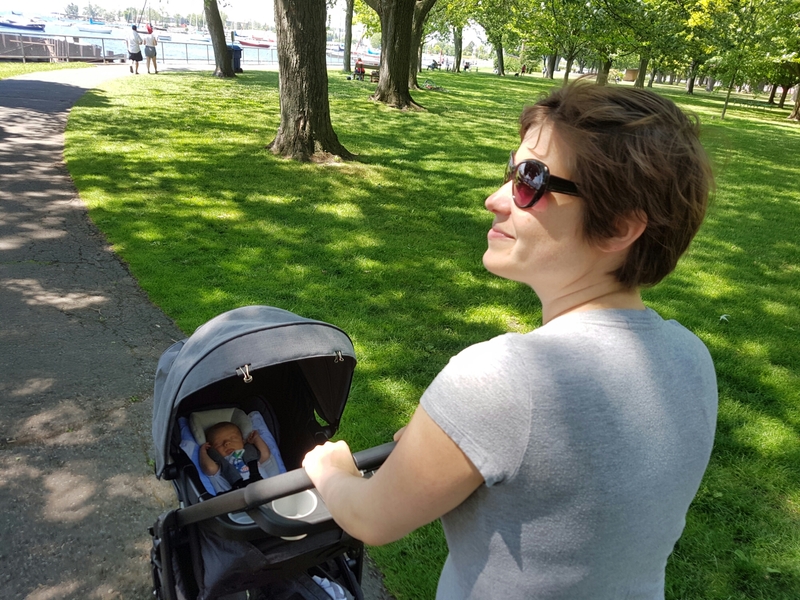 Our walks are typically to the local Starbucks, and then on to Shopper’s Drug Mart to pick up that other item that we needed so critically (note – when your Diaper Genie liner has a black line on it, it’s too late to think about going to the store to buy another refill…). On the sidewalk, the hard plastic wheels do just fine. The Graco Modes pushes easily, and the steering is great. One-handing this bad boy while pounding a grande three-pump affogato style mocha Frappuccino (closest thing Starbucks can get to an Ice Cap) is a breeze for my wife. On pavement? No problem! Bonus life hack: binder clips work great to secure a blanket for extra sun protection! Then we went to rib-fest. The Graco Modes has locking front wheels for rough terrain. This helps the stroller tack straight and true, in theory. The yard of Old Fort York has been punished over the last few months with music festivals and a severe lack of rain fall, which resulted in a very bumpy ride for T. While he didn’t seem to mind, I couldn’t help think that Shaken Baby Syndrome may not always be intentional… It was kind of cute to watch his fat cheeks bounce around though. Larger, pneumatic tires would have definitely resulted in a smoother ride. If you are the family that spends a lot of time in the park, it might be worth going with a stroller that has some form of shock-absorption. 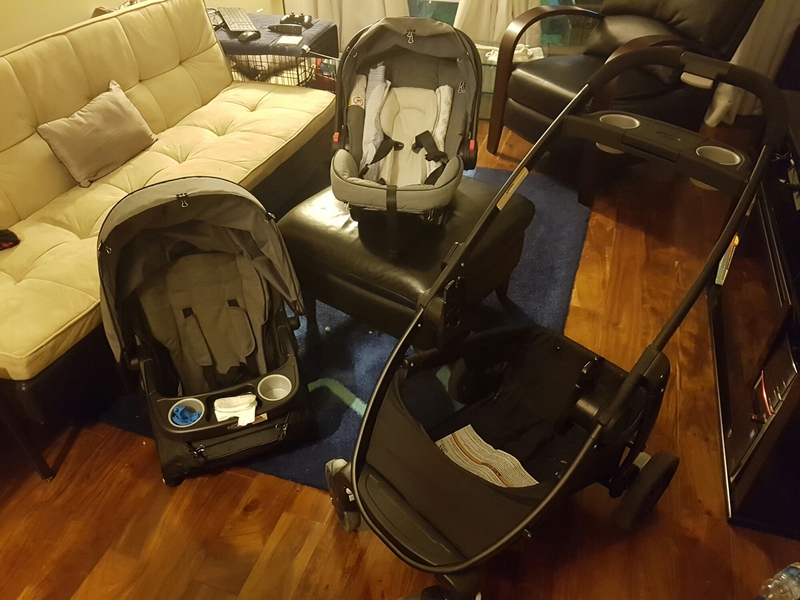 The Click-Connect comes in 3 parts – the base frame, a seat which can be reclined and used as a bassinet for newborns, and a car seat (reviewed separately). All 3 can be connected at the same time, or if you are looking to lighten the load, you can connect just the seat or car seat to the frame, leaving the other piece behind. Seats can be arranged facing out or facing in, depending if you want to share your little one with the world or keep him all to yourself. With a variety of seating options, this stroller is convenient and grows with your child. The Graco Modes is built with an aluminum frame, making it light-weight yet stable. Assembly is straightforward with great instructions, and all the pieces fit together with a satisfying ‘click’. The breaks feel a little feeble but they get the job done and act in tandem, so you don’t need to lock each wheel independently – just make sure they are actually engaged though, sometimes you need to roll the stroller back a centimeter or so and try again. The material on the seats is strong and easy to keep clean, the canopy extends a long way and holds up well against wind, rain, and sun. Let’s face it – strollers are expensive. Sometimes prohibitively so (looking at you 4moms…). Finding the right stroller at the right price is a challenge. Try to find a stroller that will outlast your child, fill as many of your needs as possible and still fit in your budget. Start shopping early and keep an eye out for sales. Regardless, I would advise strongly against buying used – you have no idea what kind of torture someone else’s stroller has endured, and this is a key safety element in your child’s life. If you have no other option, please be sure to inspect it thoroughly and check for any recalls. We got our Graco Modes when Toys R Us had a clearance sale. For everything it does, we got great value. However even at it’s standard price of $679.99, it is still a great deal when you consider that a car-seat will cost about $200 anyway. So would I recommend the Graco Modes to friends? I’m really on the fence. Don’t get me wrong, we love this stroller, it works wonders, holds everything we need, and is (almost) up for everything we throw at it; but it won’t be THE stroller for everyone. That said, if you are looking for a light-weight, compact, durable travel system and can get it on sale, this is absolutely the stroller for you! Did we get the right one? Let me know what stroller you have, and how it fits your daily life in the comments below!